For many fans, Alex Rodriguez has always been more hype than hope. Although he has impressive numbers, there are those who insist that he is famous for showing up on winning teams only to cool them down and make them not-so-winning teams. Given the fact that A-Rod, as he has become known, was once the highest paid player in the game, and the man just seems to have placed a target on his back for criticism. The fact is, Rodriguez's career numbers scream that he is a force to be reckoned with. There was time, not too terribly long ago, when it was typical for him to end a season having racked up over 50 home runs. In fact, for his entire career, he has 638 homers. He also has 1,915 RBI and 2,831 overall hits. He has a batting average of .301. And, yet, the rumors that he is in decline continue to dog him. The truth is, that he has declined a bit over the past couple of seasons. Even starting things out in 2012, there were many who shook their heads and said that A-Rod should just hang up his cleats and go find something else to do. 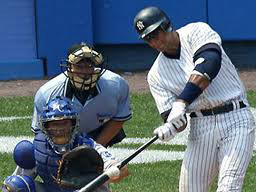 During the first 59 games of 2012 A-Rod hit only nine home runs. While any home runs is impressive for the average hitter, for Alex Rodriguez, this was less than overwhelming. However, those nine home runs were enough to shoot him into the number five slot in the Major League record books of all time home runs. Now, people are starting to wonder, can A-Rod finish the 2012 season by surpassing one of the most beloved players the game has ever known? Willie Mays played 22 seasons with the New York Giants, San Francisco Giants and New York Mets. He was a huge fan favorite and he notched enough home runs to earn a spot as the number 4 all-time home run hitter. With Alex Rodriguez hitting to get into the 5 slot, now fans are wondering if he might have enough left in him to get into the number 4 slot and surpass Willie Mays. Currently, Alex Rodriguez has about 22 home runs less than Mays. However, if Rodriguez can remain free of injuries, he could still end up playing well over 130 games for the season. Even at the reduced rate at which he has been hitting it out of the park, he could easily finish the season by hitting about 25 home runs. That would put him well past Mays. For some fans, this is a remarkable thing and shows that Rodriguez really is the great player that many have claimed him to be. For some, it would be a sad thing to have A-Rod in that slot. In the end, whether or not he can break that record in 2012, or will do it in 2013, remains to be seen. One thing is for sure, just when many thought A-Rod's homerun output was dismal for 2012, he started hitting them out of the park again. So, the tale of Alex Rodriguez and his pursuit of the number four slot is far from told.